6pm; 8pm Latin, 8pm Spanish at Convent and Midnight Mass. 8am; 9.30am and 11am Latin. No Evening Mass. Christmas Offerings: In the porch & around the sides of the Church are the envelopes for your Christmas Offerings for Fr Marcus & Romany. As you are aware, a priest does not get a salary as such, & relies on the Collections at Christmas & Easter, as a primary source of income. These two collections are the only ones that are for the priests of the parish. Please be generous as your means will allow. Christmas Eve - 8pm Traditional Rite Anticipated Midnight Mass: followed by the procession to the crib, blessing and singing of the Christmas Martyrology. Music: Mozart’s Coronation Mass. Offertory: Hodie Christus Natus Est by Marenzio and Communion: O Magnum Mysterium by Victoria. The Twelve Days of Christmas: lead us traditionally to the Epiphany and the liturgy for the next few weeks is meditating on the mystery of the Word made flesh. The implications of the incarnation are so many. All of creation is in some sense sanctified by the presence of God made man. That means that created matter can be a means to the end of union with God. Icons, statues and pictorial representation are all ways that we can appreciate the mystery of the Kingdom which is beyond representation. Nevertheless, with the coming of Christmas, we can actually see the face of the Lord. New Year's Eve: In this parish, we always begin the New Year with a solemn Mass to beseech the Divine Majesty for the graces we need in the New Year. Each one of us should make a New Year’s resolution to tackle some area in our life which habitually we may neglect. We will start at 10.30pm Exposition of the Blessed Sacrament and Confessions; 11.30pm Solemn Te Deum and Benediction followed by a sung Midnight Mass. Crib Offerings: This year we will be sending the crib offerings to Mary’s Meals. Mary’s Meals feeds children one good meal every day at school in 14 countries. Because of our low costs, we can do this for as little as £13.90 per child per year! Altar Servers Mass & Party: All Altar servers are invited to the 10am Mass on Boxing Day, followed by Benediction & a party in the club. Thank you from Fr Christopher: Many many thanks for your generous collection and many gifts. I was overwhelmed and deeply touched by your kindness. It was a good thing I was jet-lagged; otherwise, I might have broken by Anglo-Saxon stiff upper lip! ☺ This Christmas I will be in the Holy Land and will remember you all at Mass. I am very grateful to Fr Marcus for all of his support in our ‘swap made in Heaven!’ On 17th January I am to begin in Ramsgate. Let us pray for each other. Cook needed for January & February: We need a volunteer/volunteers for two months whilst our usual volunteer is away. If you could help us, please speak to one of the priests today. Cleaners this week: Saba Tekle, Nebiyat Zereome & Alem Araya Zemichael Please note: Wedding next Saturday at 11am. The new rota for January to June 2019 are now being sent out. Fully escorted St Patrick’s Weekend Pilgrimage to Knock Shrine, Ireland, 16th March 2019. £599.00 per person sharing. Price includes flight with 10kg hand luggage, all taxes, luxury transfers, 4 nights’ in Knock House Hotel with full Irish Breakfast each morning and 4 Course Dinner each evening. All entertainment, excursions and guided tours included. Wheelchair accessible rooms in the hotel. Limited single rooms at a supplement of £100. Groups and Individual bookings welcome. 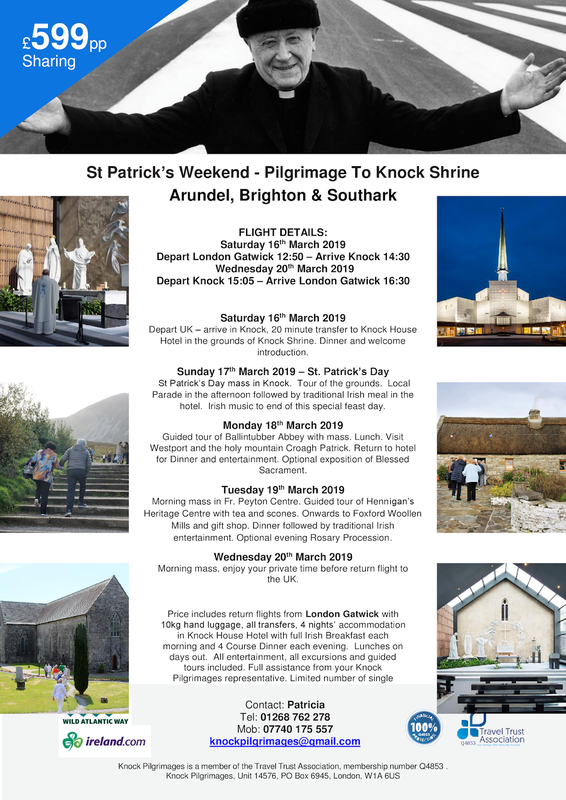 Contact Patricia on 01268 762 278 or 07740 175557 or email knockpilgrimages@gmail.com. Knock Pilgrimages is a member of the Travel Trust Association and is fully protected by ATOL T7613.